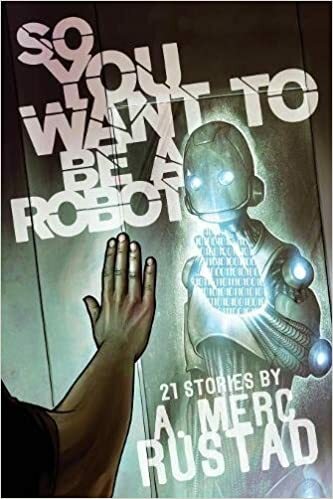 At their core, most of the twenty-one stories in A. Merc Rustad’s collection So You Want to Be a Robot are about characters struggling to figure out who they are and how they fit (or don’t) with the world(s) around them. The collection is almost evenly split between science fiction and fantasy stories, all of which feature excellent worldbuilding and give the reader plenty to think about. Rustad also covers a lot of subgenres, so there’s literally something for almost everyone in here. Looking for portal fantasy? Check. Post-apocalyptic settings? Got it. Overlords of the alien or fae variety? Covered. Transformation magic or technology? Monsters in the real world? Alien societies that are truly different from our own? Yes, all this and more. The collection starts strongly with “This Is Not a Wardrobe Door,” a portal fantasy that turns the trope on its edge. On the surface an attempt to answer the question of what happens when all the portal doors close, the story slowly turns into a commentary on the limits set in Lewis’s Narnia books. The Earth-born heroes of the story are multi-generational, and won’t stand for portals being only for children. No aging out, no “problem of Susan” here, just the question of which side of the portal these characters are more comfortable on and how they fight being separated by a too-strict set of arbitrary rules. “Finding Home” is another twist on portal stories, as a mother shuffles her son from reality to reality in search of a missing father, because she says staying too long in any reality waiting for him would kill them. What happens when the boy wants to put down roots and stay with the man he loves? Facing one’s own mortality is not easy for those of us without a literal time limit hanging over our heads. Both of these stories take the portal trope and use it to explore how we find the home we need. Post-apocalyptic scenarios are well represented by four stories, two of them linked. “The Android’s Prehistoric Menagerie” gives us a nonhuman group of protagonists who form a family after humanity is gone, creating a conversation around the idea that what we think of as inherently “human” may be far more universal, while also touching on the concept that we humans feel the need to control everything, even after we’re gone. In “What Becomes of the Third-Hearted,” Rustad explores regret and emptiness as the main character struggles through devastation to be reunited with the wife and child she’s lost. It felt particularly poignant rereading this story on the anniversary of September 11 here in the USA. The two linked stories, “Of Blessed Servitude” and “To the Knife Cold Stars,” take place in a post-apocalypse world that is a mix of small Old West-style towns which sacrifice undesirables and criminals to night demons to keep them at bay, alongside super-technological cities full of AIs and cybernetically enhanced people. Bishop comes from the former, having survived being sacrificed, and now operates out of the latter in his quest to eliminate the demons completely. In the first story, he finds himself face-to-face with his home-town’s newest sacrifice, Grace, as nightfall looms. In the second story, Grace takes center stage, trying to learn how to exist in a city so different from the town he comes from. While Bishop struggles with recalling his past, Grace struggles with losing his. The two stories work really well together and feel complete, although I wouldn’t mind reading more in this setting. The search for identity, main characters questioning not only who they are but how they got where they are, is the core of five very different stories. “…Or Be Forever Fallen” takes the “hero with amnesia” trope to a startling conclusion, using animal-ghost-guides to lead the main character through a series of increasingly disturbing discoveries about their past. The trans* main characters of “Under Wine-Bright Seas” and “Iron Aria” get help from unexpected sources (a stranger from the sea in one case, a war-hardened general in the other) in breaking away from parents/guardians who won’t see or accept the truths their children need to live. In “The Gentleman of Chaos,” Rustad explores how legends form reality, contrasting a mystical master assassin and a new king who will do anything to stave off the death and loss of power that the assassin is destined to bring, and that includes molding and abusing his own sister as a counter-defense. And in “Tomorrow When We See the Sun,” the only one of Rustad’s “Sun Lords of the Principality” stories to appear in the collection, a gender-neutral AI is affected by the execution of a rebel and goes on the run in search of answers and identity. One of Rustad’s multiple strengths as a storyteller lies in couching real-world concerns in fantasy or science-fictional settings. “Winter Bride” looks at abusive relationships and how hard it is to leave them, especially if it means leaving a loved one behind to bear the repercussions, through the lens of fairy tale: a faerie king’s power over his mortal brides extends down into their very bones, and he can make them anything he wants. “To the Monster, with Love” explores Stockholm syndrome through the eyes of a character who was rescued from the monster by the angry villagers, essentially a “what happens after the happy ending of a classic horror movie” story. “A Survival Guide for When You’re Trapped in a Black Hole” is a rumination on grief, covered by the barest of science fiction coatings, and is probably the most emotionally devastating, gut-punching story in the collection. Grief is also the motivating factor in “Batteries for Your Doombot 5000 Are Not Included,” the only story in the collection that trades on classic super-hero and -villain imagery. “Thread” gives us humanity under the power of alien overlords whose language and motivation are unintelligible, a treatise on how the smallest action can unravel reality … or oppressive regimes. Transformation is present in so many of these stories. Not just the multiple stories with trans* or non-binary main or supporting characters (almost half of the total, by my count), but also in “Once I. Rose,” with its endlessly reincarnating rose bush, and “The Sorcerer’s Unattainable Gardens,” where the author’s alternating use of second-person present tense and third-person past tense keeps the reader off-kilter and unsure of who is who, what is what, and where the story is going. Two stories combine all of the themes explored in the other stories. “Where Monsters Dance” is a bit of portal story, as the main character must travel to the home of monsters to rescue her girlfriend. The missing girlfriend’s quest for identity and acceptance is a driving subplot. The trauma of an abusive stepfather drives the main character’s actions in the past (when she throws off childish things, along with her staunchest defender) and the present (when rescuing the girlfriend means encountering those childish things again). The closing story of the collection, “How To Be a Robot in 12 Easy Steps,” gives us a main character on the autism spectrum who feels overwhelmed by her romantic feelings for a retail store robot clerk while wishing she could physically be the robot she feels she really is, and at the same time coping with familial expectations for herself, her boyfriend, and her boyfriend’s boyfriend. It’s another story in which Rustad plays with form, alternating first-person narrative with “listicles” made by the main character. It’s also not an easy story to read emotionally, because the main character is so relatable. So many of us struggle with figuring out who we are, who we want to be, and how we fit into the world around us (especially as it changes and reveals itself to be in many ways less kind than we hoped it could be). A. Merc Rustad’s characters don’t necessarily find all the answers they are looking for—many of them will continue their searches far beyond the end of the stories we meet them in—but their motivations, sacrifices, and decisions will ring true with any reader who is similarly searching. I am awed by all of the different worlds and realities represented in this collection. After reading a review like this I will have to get my hands on a copy and seek out more work by this author.